Judith Halberstam is Professor of English and Director of The Center for Feminist Research at USC. Halberstam teaches courses in queer studies, gender theory, art, literature and film. 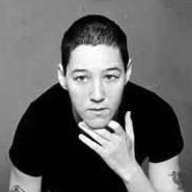 Halberstam is the author of Female Masculinity, The Drag King Book, Skin Shows: Gothic Horror and the Technology of Monsters, and a new book from NYU Press titled In a Queer Time and Place: Transgender Bodies, Subcultural Lives. Nonfiction Editor Dustin Diehl conducted this interview with Judith Halberstam. Dustin Diehl: I'm more familiar with your work in gender and queer studies, so I was surprised to find that you have a fascination with horror, especially in film. Explain how you came to write about horror. Judith Halberstam: I worked on Gothic literature in my dissertation and I wrote about monster-making as a 19th century technology for understanding racial and sexual and national differences. My dissertation focused a lot on the intersections of anti-semitism and homophobia in the construction of monstrous others. When I came to revise my dissertation and turn it into a book, i decided to bring the study up to date and include material on horror film. DD: Your work has been considered, by some, to be a part of the new literary canon on queer and gender studies/theory. Where have you seen this field come since you started writing? Where do you see it going? JH: I do think I was part of an explosion of work and interest in queer studies in the 1990's that built upon earlier work on gender and sexuality but that also broke away in new directions. This field has since become much more intersdisciplinary - it used to be very concentrated in English departments but luckily now queer studies is widely dispersed among and between different fields of study. Where is it going? Well, the fields that make up queer studies have become much less parochial in recent years - less focused on an anglo-american canon of literary texts, much more global in reach and perspective, much more able to discuss race and ethnicity and class alongside gender and sexuality and desire. I hope the field is going to become less focused on institutional recognition and more interested in generally disrupting business as usual. DD: What has been your experience working with students at the University of Southern California? JH: Pretty good! The students are definitely conservative here, very conservative, very business oriented, but then that provides a challenge. One is not preaching to the converted but actually having to engage with people who don't know why they should care. Plus the graduate students are amazing here. DD: Explain what kind of message you hope to leave with your students. JH: Be bold, think big and small, take a risk, fail often, challenge yourself and everyone around you. DD: How have some of your favorite queer/gender theory writers impacted you? DD: Some critics claim that your work actually reinforces gender binaries. As a writer, describe how you deal with this kind of criticism. JH: I understand that criticism but I don't think that a gender binary is simply a problem - it is the meaning of the binary, its tendency to hierarchize and discipline. I actually believe in social categories and in adding to them. I am not someone who believes we should be getting rid of gender or categories, social categories are important markers of difference. The task is to multiply them. DD: Comment on how you see your work affecting the next generation of queer and gender theorists. JH: One never knows whether one will affect anyone else let alone a new generation of queer theorists and writers. I try to lead by example - if my work is useful, use it. if not, let it die and move on! I am not trying to create a legacy so much as to drop intellectual bombs on zones of complacency...sometimes you just need to stage an intervention not try to go down in history! DD: I really enjoyed your contribution to the film “Boy I Am.” Describe your experience working with film, as a writer. JH: It was fun, it was a very cool film in the sense that the film makers really thought about a lot of different angles and tried to represent as many of them as possible. I did my interview in an afternoon in Brooklyn - we had a good time, i didn't think I would ever hear from the film or the film makers again and I was amazed when the film circulated widely and was pretty good! DD: What advice would you give someone interested in writing about gender and/or queerness? DD: “The Drag King Book” is a wonderful mixed medium book. Comment on some of the benefits you see in having art/photos/film integrated with your writing.